Financial Poise™ Faculty Member and Family Office Editorial Board Chair Ron Diamond moderated “When and Why Should Families Not Invest Directly?” in Chicago, on June 20th. The panel enjoyed a fascinating conversation on how family offices are investing in private equity with some of the top experts in the country, including Paul Carbone from the Pritzker Family Office. 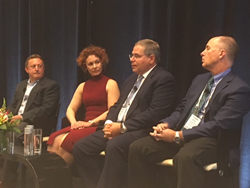 Financial Poise™ is pleased to congratulate Ron Diamond, Chair of The Family Office Advisor, a Financial Poise™ editorial board and CEO of Diamond Wealth Strategies, on his panel participation at the 6th North American Family Investment & Alternatives Conference on June 20, 2018. The 6th North American Family Investment & Alternatives Conference brought together industry experts and ultra-high net worth families and individuals from around the world for networking, exclusive investment opportunities, and innovative presentations by key players in the family office realm. Mr. Diamond moderated the panel, “When and Why Should Families Not Invest Directly?,” which examined whether family office executives have the contacts and expertise necessary for direct investment, and why investing with a manager is a better option. Following his successful panel presentation, Mr. Diamond noted that, "The panel enjoyed a fascinating conversation on how family offices are investing in private equity with some of the top experts in the country, including Paul Carbone from the Pritzker Family Office." The 6th North American Family Investment & Alternatives Conference, a two day event, took place in Chicago on June 19-20, 2018.